I have been chasing down some gremlins in my engine and I think I have finally figured out the whole story. I posted a thread not too long ago about a misfiring engine and an injector not sealing. I am in the process of replacing all of my injectors and decided I should replace the #7 cup since I had an injector fail to seal twice (or so I thought!). In late 2015, I was moving from Connecticut to San Diego. I had dropped a load of stuff off at my sister's house near Houston since I was not taking it all the way to California. I headed back to Connecticut and started smelling raw diesel when I was driving through Baton Rouge. I had some bad injector cups that were leaking fuel into the cooling system, so I had to get all the cups replaced at a dealership since I was 1800 miles from home with no tools and few options. The dealership replaced all 8 cups. I noticed a little bit of smoke coming from the tailpipe on the way home, but figured it was due to some air in the high pressure oil system and it would eventually work its way out. The tailpipe smoke never went away, so I started digging into the problem about 18 months after the cup replacement. A buzz test revealed that the #7 injector sounded a bit muted and weak. I pulled the #7 injector and found a blackened end along with several small pieces of metal in the bottom of the cup. I assumed the copper washer fell off the injector during installation and the heat melted the washer. I cleaned out the cup, assumed all was well, and installed a new injector. The smoke cleared up and everything seemed fine. Drove the truck for another 18 months or so without any problems, including a cross-country move from San Diego to New Hampshire (the Navy seems to like for me to move back and forth between opposite corners of the country). A few weeks ago, my truck started misfiring really bad and would barely run. All signs were pointing to the injectors, so I decided I would just go ahead and replace all of them, even though they only have about 140,000 miles on them. 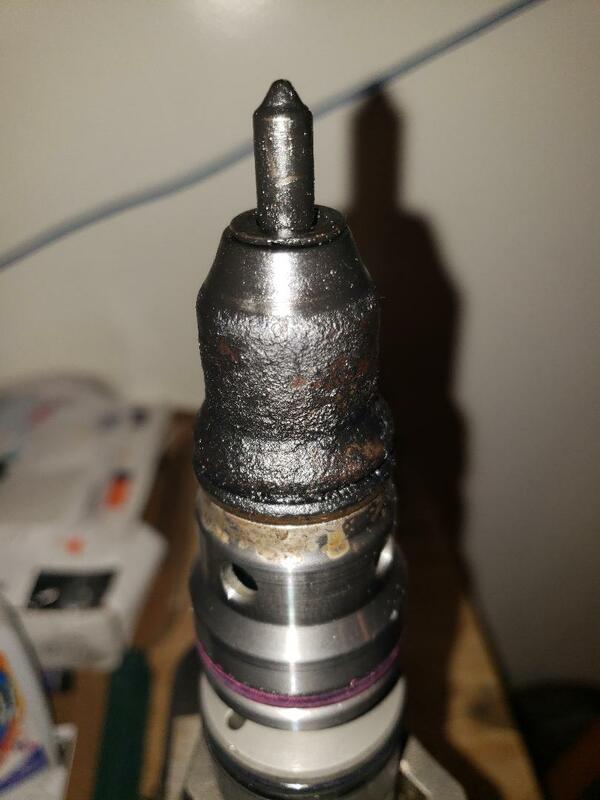 I pulled the #7 injector and found a blackened end - this time much worse than the first time. There was scaly black carbon covering the lower part of the injector (the entire area below the lowest o-ring). 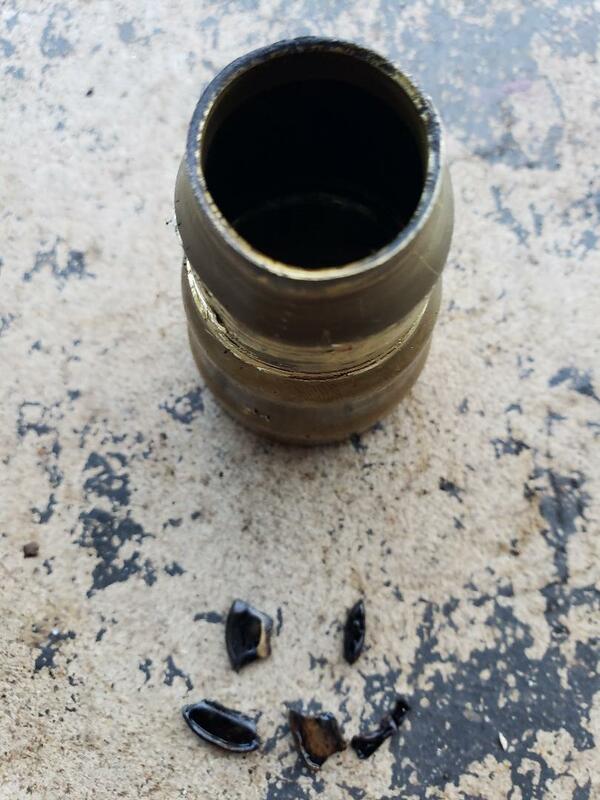 Due to another injector sealing problem, I figured the cup was damaged and should be replaced. I pulled the cup today and got a whole cup minus the bottom flat part (with the hole) that seats against the head. I figured crap - the bottom of the cup broke off, so I tried to figure out how to get just the bottom of the cup out of the bore in the head. After cleaning up the bore really well, I noticed that the bottom of the bore looked like cast iron instead of brass. I wondered what in the world happened the to the bottom of the cup. Then it hit me - I bet those melted pieces of metal that I found 18 months ago were actually the bottom of the cup and not parts of a copper washer. Turns out I was right - I still had the little melted pieces (don't ask me why I kept them, but I'm glad I did) and looking at them, they are definitely brass and not copper. This would explain why the new injector did not seal - there was no cup bottom to seal to! At least I don't have to try to fish the bottom of a cup out of the head. Just need to clean up the bore and press a new cup in now. To sum it up, my new theory is that the dealership installed the #7 injector without a copper washer (probably fell off during the installation process and the mechanic failed to notice). This resulted in the #7 injector not sealing at all, and the heat from the combustion gases melted the bottom of cup (that's the pieces of metal I found). I installed a new injector, but it also did not seal since the bottom of the cup was missing. I basically had the same thing happening again, and the bottom o-ring finally lost its ability to hold back the cylinder pressure and combustion gases. I also might have found another potential cause of the misfire. My ICP connector had some oil in it, so that probably messed with the ICP signal. ICP looked fine when I monitored it with AE, but I only watched it for a few minutes. New ICP sensor is on the way. I figure that's probably the craziest injector cup story anyone has ever heard. You can't make this **** up! AutoEnginuity w/ Ford Enhanced package - New Hampshire seacoast - Just bring beer! As clean as the bottom edge is, it looks more like the dealership knocked the bottom out of the cup with a cheesy injector cup install tool. I suspect that if it had melted away from a bad copper washer seal, it would be a lot rougher edges. Which tool did you use on the reinstall? The Riffraff tool supports the cup at the flanges instead of the bottom. Last edited by RT; 01-08-2019 at 03:54 PM. Knocking the bottom out is a possibility. I used the Riffraff tool - by far the best tool for this job! The Riffraff injector cup tool is the best, they gave me one when I got my injectors, and its the best out there. I have never seen an Injector install tool though, I just pushed them in by hand, and torqued to spec. They pop in like nothing, don't really need a tool, as said, never seen one before. Anyway, I hope Riffraff sold you the green sealant for the cups as well, or your going in again. Its mandatory. I have never seen an Injector install tool though, I just pushed them in by hand, and torqued to spec. Well, now I've seen one. Lol. Wonder if any dummy actually bought that. Scroll down a bit and get a look at the fuel line disconnect tool they sell for 53 bucks as well. Bahahaha, who could be so silly as to buy one of those. People gotta get more creative. I cant believe they make either of those tools. Injectors push in with one finger. No tool needed there. And if anyone else besides me ever noticed, every router and hand grinder set, or Dremel type tool, comes with a tool that you use to hold the collar when tightening in a new bit. That tool is an exact fit to the disconnects, and works better than a flimsy 53 dollar specialty tool. I got about 10 of those kicking around, and the sellers of those tools will give you one for free if you email them. Save yourself some money and get creative. And eat your Wheaties so you don't need a tool to put an injector in a hole. Hahahahaha! Absolute you are right on the money. I try and make most of my special tools if I have time. Our get my boy to make it on his CNC machine at the wedding school. We were talking about the injector cup tools - the only tools I have ever needed to install an injector are my hand and a rubber hammer. I will generally try to make my own special tools if I can just weld up some scrap steel and maybe throw a little bit of threaded rod in. I have made a spring compressor for a C6 transmission, an axle spreader for installing differentials, and a crankshaft holding tool for Honda/Acura. I'm sure there are several others I am forgetting. Injector cup extraction and installation tools are a little beyond what I can make at home, and a crude tool is not a good choice for that job! Agreed, some tools take too much time to fab up, better off buying one or renting. Wouldn't want to scratch up a new cup beating it in with a home made tool. If your in a pinch though, Canadian Tire rents every tool they supply for free. Don't think they'd have a cup tool though. I'd gladly lend anyone mine if you near me. Riffraff gave me one for free cause I spent a small fortune there doing my build. 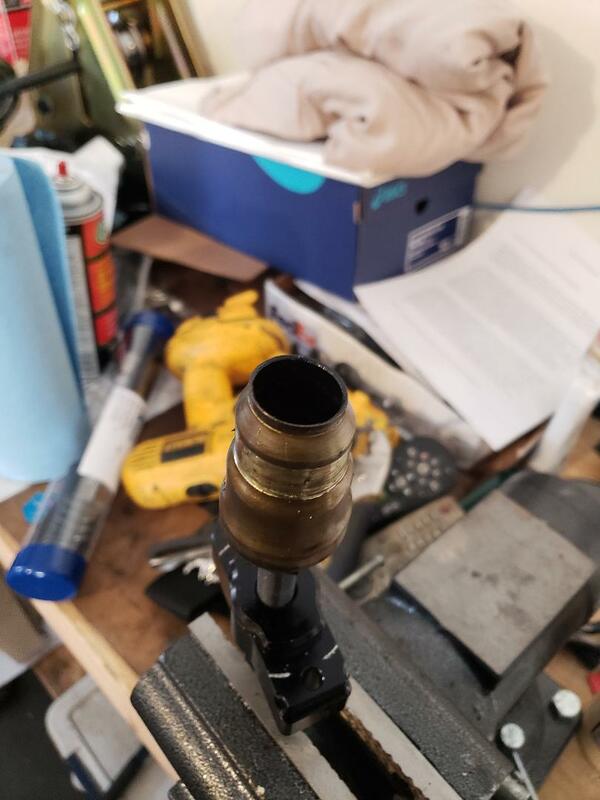 Free to all, gimme a PM if you need it.
. Injector cup extraction and installation tools are a little beyond what I can make at home, and a crude tool is not a good choice for that job! I have one question: How were you able to remove that injector cup with it bellowed out like that? It appears its not bellowed at all when I look at it. It looks like the whole bottom of the cone is gone. So it appears bellowed, but its just missing the portion up to the first gasket. Amazed none of that metal made it into the cylinder. Thankfully the metal is soft, so it would probably just burn up and probably no damage if it did. I have a camera that fits down through that hole to see, I would look for dents and damage to the top of the piston, may even be metal welded on top. Better get it out now if it did. Its easy to do without removing the head if you need too. PM me if you need to know the procedure to clean the top of the piston without head removal. So I went digging and asked around. This is more common than I personally was aware of but not of epidemic proportion. Check for any cooling system concerns and correct them. The brass cups suffer if the engine is overheated, nor do the brass cups like the newer coolants people seem to think are okay to use. If you can source stainless steel injector cups for this engine that should cure it of a repeat failure. I know you can get stainless cups for the DT466e, but I've never seen or heard of them for the DT444e or the 7.3 - have you seen them?